“This better be worth it,” I snapped at my brother as we violently bounced along the last three unpaved and exceedingly rough miles of the 13-mile road to Bodie, California, leaving behind a colossal cloud of dust — and countless parts of his car. I didn’t trust him. And the unexpected spinal realignment I was receiving didn’t make me particularly like him, either. But once I caught my first sweeping view of Bodie State Historic Park — the largest, best-preserved ghost town in the United States — he was my new best friend. Collapsing buildings, rusting equipment, and slanted utility poles are all that remain of what was once one of California’s largest cities. We all have mental images of the Wild West, largely evoked by such names as Annie Oakley, Billy the Kid, Wyatt Earp, Calamity Jane, and Butch Cassidy, and framed by Hollywood blockbusters, second-rate oaters, and spaghetti westerns — the lawlessness, the shootouts at high noon, the saloon brawls, a player piano somewhere in the background. 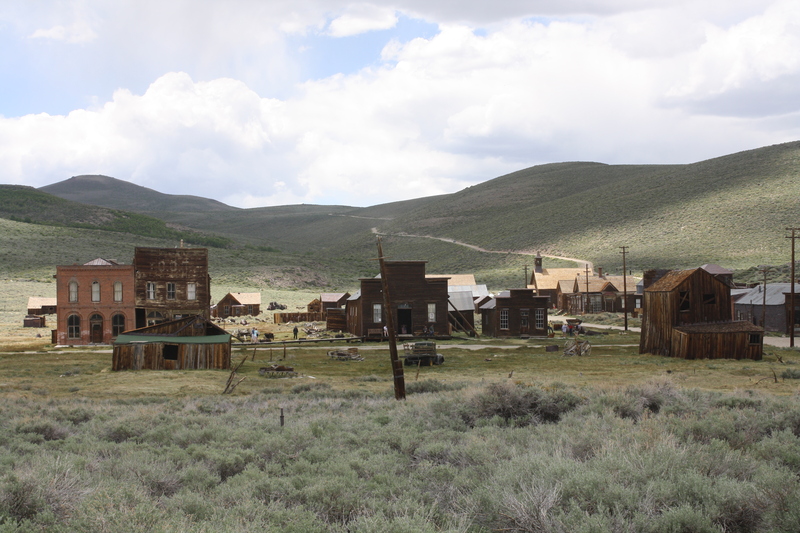 If there’s any place in the United States that encompasses everything you ever thought about those heady days of gold rushes and tin-star sheriffs, Bodie is it. As soon as I stepped out of the car, I was enthralled by what lay before me. The vast expanse of this barren, unforgiving, treeless landscape near the Nevada border struck me as the most inhospitable location to establish a city. Nevertheless, littered throughout the valley are 100 buildings frozen in time in a “state of arrested decay” — remnants of the structures that survived devastating fires in 1892, 1932, and 1954. At its peak in 1880, 10,000 people were living in this rowdy gold-mining city, one of the largest in California; now, the only residents are some skittish chipmunks. As I began to explore this vast ruin on its dusty streets, I was instantly transported back to more than a century ago, to a life and time that I found nearly impossible to imagine. But I tried. On the one hand, Bodie seemed to me to have been like any other Western boom town of its time, complete with wood houses and brick buildings of varying sizes and refinement, general store, firehouse, bank, hotel, barber shop, school house, post office, Odd Fellows Lodge, Masonic and Miners’ Union halls, jailhouse, stables, morgue, bowling alley — all now in various stages of decrepitude, some still in remarkably good condition, others on the verge (or past the point) of near collapse. 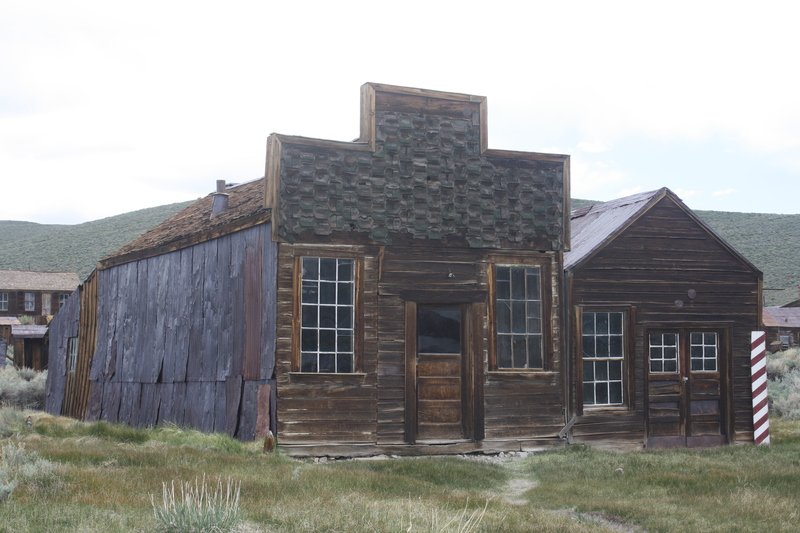 The Sam Leon Bar (left) and the barber shop are two of Bodie’s survivors. 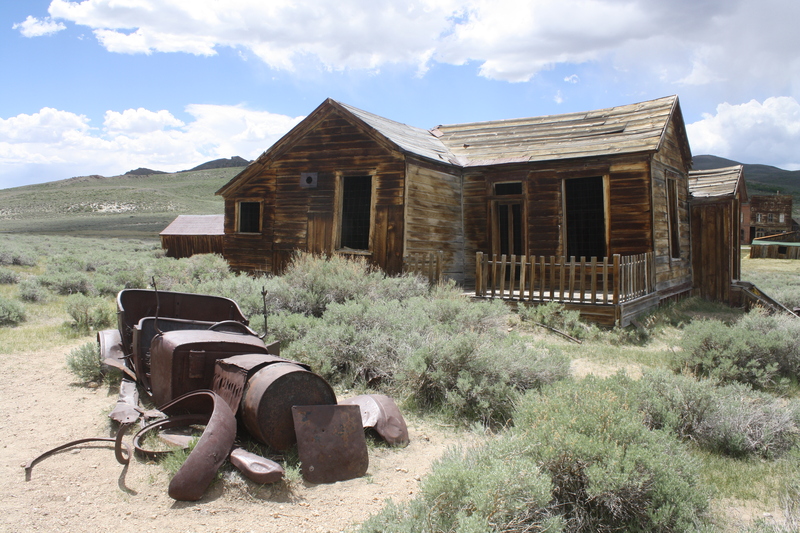 Bodie even had a baseball league, horse racetrack, and magnificent county courthouse. There was elegance and grace here, too, with a social season of charity events and genteel balls, and with hotels that served superior meals on white linen tablecloths, with fine china and etched crystal drinking glasses. The romanticism of this site could be overwhelming, but I allowed the reality to temper it. These people’s lives were hard. At 8,375 feet above sea level, Bodie was subject to exceedingly hostile weather, and most of the homes could not have fully sheltered their residents from the searing summer temperatures, ferocious winds, subzero winter freezes, and crippling blizzards. Trips to the outhouse must have been hellacious. Miners endured long hours and backbreaking work, pulling $15 million in gold out of the ground over 25 years at the massive gray Standard Mill, still standing on a hillside at the edge of town. The next town was 14 miles away, and the sense of isolation must have been taxing. Homes and cars in Bodie all suffered the same fate. One of the most substantial remaining buildings is the Methodist Church, erected in 1882. Despite the presence of this house of worship, and a few others that have disappeared over time (including a Catholic church and a Taoist temple for the residents of the city’s Chinatown), Bodie was hardly a clean-living kind of place. Nearly 70 saloons guaranteed belligerent behavior, prostitutes in the red-light district were readily available, plentiful opium dens welcomed everyone, and gambling halls helped ensure that the poor stayed that way. Stage holdups, robberies, and killings were so frequent that they make today’s crime statistics seem admirable. So, on the other hand, Bodie was hardly a sedate, idyllic locale to raise your family. But it wasn’t just the dilapidated buildings I was exploring that shaped my impressions of this American dream / nightmare. All the other detritus — the lopsided utility poles, the rusting shells of early automobiles, the wheelbarrows and heavy machinery, the fire hydrants, the crooked street signs —contributed to my developing conclusion that Bodie was one heck of a lively town. When the gold ran out, however, people began to abandon this “sea of sin, lashed by the tempests of lust and passion,” according to the late Reverend F.M. Warrington, who was clearly horrified by what he saw in 1881. And what they left behind was even more fascinating to me than the structures and debris. Although most of the buildings are closed, you can peer through the windows and marvel at the dust-covered material goods they chose not to take. From coffee presses to Ghirardelli chocolates, Bodie had it all — and left it all behind. Having driven up that rough road in a car in the 21st century, I understood why they might have left behind the roulette table, billiard table, and cast-iron stove rather than secure them onto a horse-drawn wagon without shock absorbers for their long journey as they moved elsewhere. But why not take along the canned goods, the box of Ghirardelli chocolate, the overcoat, the baby carriage, the schoolbooks? It was as if they had fled in a frantic exodus from a nuclear explosion, and I couldn’t fully grasp why they would leave in that much of a hurry when there was no reason. Even without answers, these personal relics provided me with an intimate look at the daily lives of the people who toiled and played, prospered and failed, fell in and out of love, and were born and educated here. Resting in peace at the Bodie cemetery. Plenty of people died here, too, including Waterman S. Bodey, the city’s founder. He’s buried in the cemetery up a separate trail away from the town. The lonely tombstones, no longer visited by friends or family of the deceased but only by travelers such as myself, tell their own stories. I was moved by the marker for a child (“Leslie G. Nicholls, June 17, 1908 – Oct. 4, 1908, Our Darling”) and intrigued by those of immigrants from Denmark, China, England, and Ireland who probably never thought they would end up being buried in this desolate place so far from their home. From the cemetery, I gazed at the view of the entire town. Having saturated myself with this unique sliver of American history and now standing here among the dead who must have faced unthinkable hardships, I felt more than a little embarrassed when I reflected on how I complain about slow Internet service while sitting in my comfortable air-conditioned apartment back home. Since that initial visit, I’ve been back to Bodie two more times, always fully prepared for a bone-jolting drive. But the anticipation of the magical and tangible history that awaited me at the end of it made it seem like smooth sailing. Hello Stephan, I was happy to find your article because my great grandparents immigrated to Bodie from England. 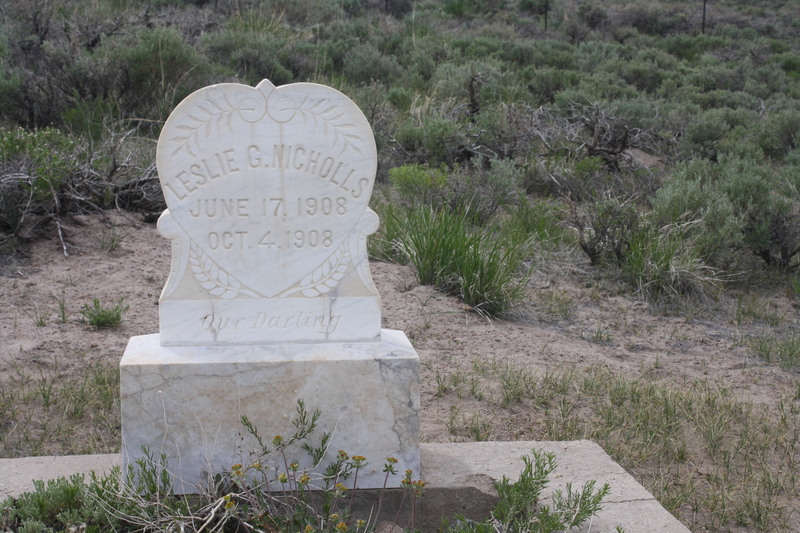 In fact the tombstone that you feature of Leslie Nicholls is my great uncle! After he passed as an infant, they had another son and named him Leslie Nicholls as well, he lived into his 80s along with my grandmother, their third child. My family is going to Bodie this summer, we have not been in many years, and my children have never been. Thanks for the article! Wow. Thanks so much! 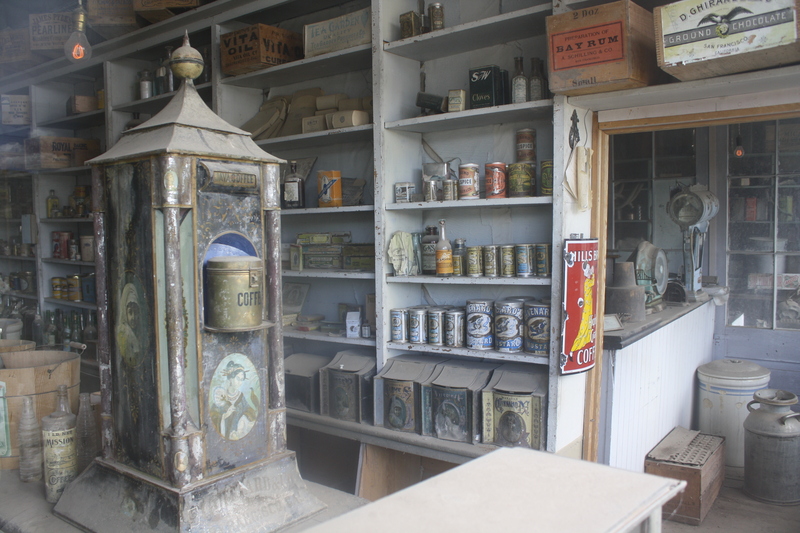 Bodie is such an incredible place — and you just made it much more personal for me. Of course, now I have dozens of questions for you… Have a terrific time there this summer. We’re really excited to go. I’d be more than happy to answer any questions that we can answer. I’m excited for you! So many questions….Why did your family immigrate there? What did they do? How long did they stay? Did they regret it? What was life like? I’m profoundly curious.